How Does an Aphid Cause Damage to Plants? If people who study insects have anything good to say about aphids, they've kept it to themselves. Mother Nature seems to have chosen aphids as the ultimate plant-feeding machines, capable of piercing several layers of tissue to reach the phloem sap that sustains them. They're also capable of reproducing quickly. A single aphid, typically under 1/8 inch long, may produce tens of thousands of descendants within a few weeks. In the process, the insects damage their host plants in multiple ways. An aphid's mouth contains two specialized tubes, a food canal and a salivary duct. They're located in a tissue-piercing stylet the insect sinks into stem, leaf or root tissue. For about one minute after it hits a phloem-transporting vessel, the insect pumps watery, sap-diluting saliva into the plant. It then starts sucking the saliva-and-sap mixture back up through the food canal while continuing to pump saliva into the feeding site. The saliva prevents defensive chemicals in the plant from clotting the damaged cells and stopping the sap flow. Most plants tolerate light aphid feeding with no discernible damage. 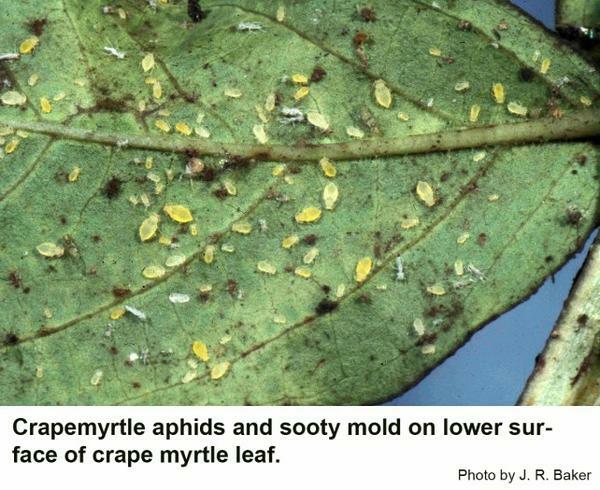 As the aphid population grows, however, infested leaves start wilting and yellowing from nutrient loss. Aphid feeding often stunts newly emerging growth. 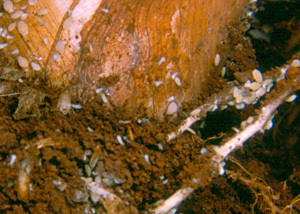 In large numbers, root aphids may drain enough sap that a plant stops growing. Some species, such as the leafcurl ash aphid (Prociphilus fraxinifolii) and plum leafcurl or leafcurl plum aphid (Brachycaudus helichrysi), inject their hosts with cell-distorting saliva that permanently curls the young leaves they feed on, and the curls are protective shelters for the aphids. Aphids damage plants most seriously by transmitting numerous viruses. Aphids on an overcrowded hosts begin producing winged offspring that leave for less congested quarters. When in flight, the insects can't identify their host plants. So they sample sap from several plants before finding new homes. 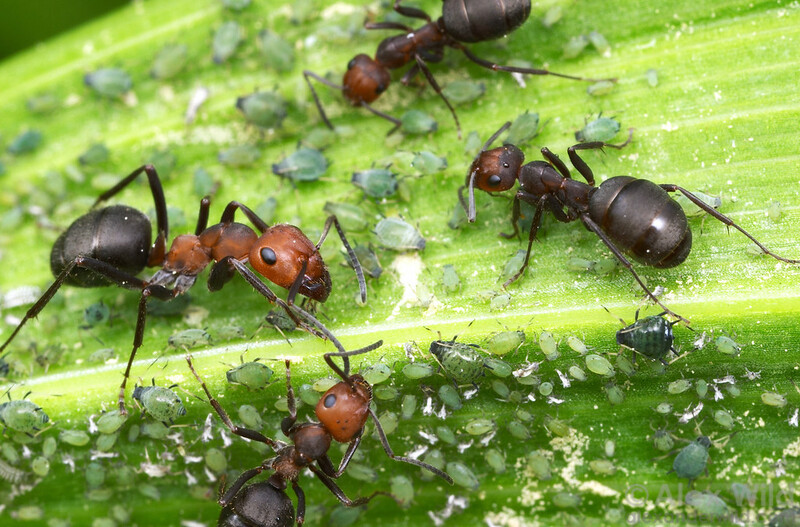 If one of those plants carries a virus, the aphids acquire it immediately. Over the next few minutes to several hours, their saliva transmits it to any other plant they test. Like all plant-piercing insects, aphids need large amounts of nitrogen. To get it, they drain phloem sap. After extracting the nitrogen, they excrete what's left as sticky, messy, transparent honeydew. Honeydew attracts streams of sugar-loving ants that kill the aphids' insect predators. 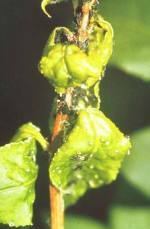 Aphids' honeydew is a magnet for airborne sooty mold fungi. Fungal spores feeding directly on the honeydew germinate into speckles or layers of black, sooty material.